We do not frame our oil painting reproductions. Hand-Painted Art Reproduction is an expensive product, and the risks of damaging a painting stretched on a frame during transportation are too high. 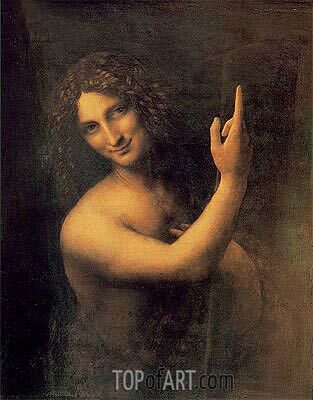 St John the Baptist by Leonardo da Vinci is, therefore, not framed, and will be sent to you rolled up and packaged in a strong and secure postal tube. Your St John the Baptist Canvas Print is individually hand-made, using sophisticated digital technology. The process of Giclée print technology imparts to the Art Print a vivid clear color, an incredible level of detail, and the authentic charm as from a museum original. The unframed print of St John the Baptist will be shipped rolled up in a postal tube. The framed Canvas Print will travel packaged in a cardboard box with additional corner protectors. 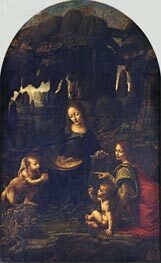 St. John the Baptist is an oil painting on walnut wood by the artist Leonardo da Vinci. 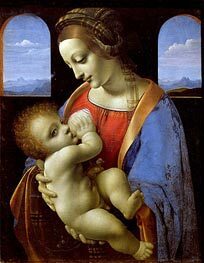 Completed from 1513 to 1516, when the High Renaissance was metamorphosing into Mannerism, it is believed to be his last painting. The original size of the work was 69x57 cm. It is now housed at the Musee du Louvre in Paris, France. The piece depicts St. John the Baptist in isolation. St. John is dressed in pelts, has long curly hair, and is smiling in an enigmatic manner which is reminiscent of Leonardo's famous Mona Lisa. He holds a reed cross in his left hand while his right hand points up toward heaven. It is believed that the cross and wool skins were added at a later date by another painter. 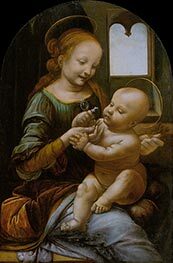 Some have also argued that St. John's appearance is androgynous or hermaphroditic, a theory that is supported by a sketch by Leonardo known as "The Angel in the Flesh". The pointing gesture of St. John toward the heavens suggests the importance of salvation through baptism that John the Baptist represents. 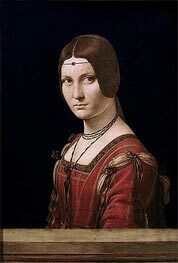 The work is often quoted by later painters, especially those in the late Renaissance and Mannerist schools. The inclusion of a gesture similar to John's would increase the importance of a work with a religious conceit.